To bring history to life, Georgia Public Broadcasting (GPB) partnered with FableVision Studios to create Georgia Race Through Time, a new history game for 8th graders. 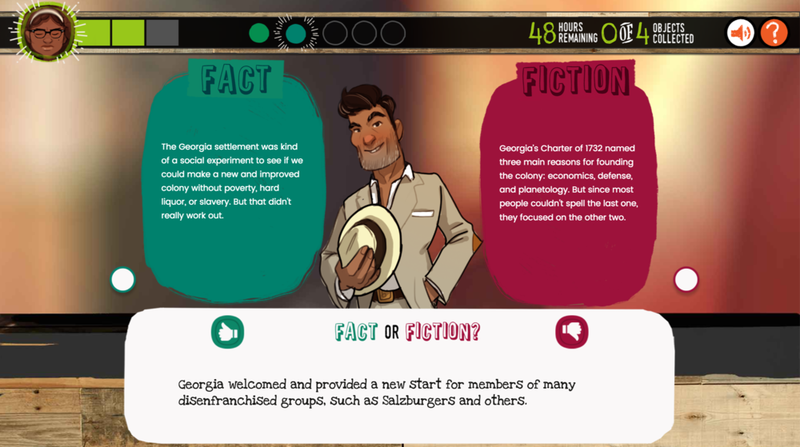 Developed to work in tandem with their Georgia history textbook and digital field trip offerings, the game offers a more contextual learning approach to Georgia history. With the addition of Georgia Race Through Time to GPB’s roster of classroom resources, the game provides an engaging, story-based approach that draws students in to make connections between history and their present-day surroundings in the state of Georgia. Students play Georgia Race Through Time as Savannah, an all-around Georgia enthusiast and antiques collector. She receives a mysterious email from Museum Director Ms. Rosetta Powers inviting her to participate in the Georgia Race Through Time scavenger hunt. Savannah and her trusty canine companion Peaches travel all over the great state of Georgia and are given a set of challenges in each city to uncover an artifact. FableVision developed and designed the layout of the game (which includes five mini-games), created 25 travel poster backgrounds, and incorporated art, animation, and music, complete with original background art and characters. Aligned to standards, FableVision wrote the script and innovatively harnessed and embedded rich historical content and historical primary documents provided by GPB.